This is not what I would typically cover on this site but I wanted to get this out before the online servers shut down for Gravity Rush 2 on 2017/1/18. I also didn’t feel like making a separate site to put this up and this is really just a personal blog for me to put whatever I want on here. Osamu Tezuka is mentioned in one of the images so eh, close enough. If you’re on this page you probably already have some kind of interest in the Gravity Rush series but on the off-chance you don’t, then please give both Gravity Rush and Gravity Rush 2 a shot. Although it seems that Sony is going to proceed with shutting down the online servers for Gravity Rush 2, the bulk of the content is unaffected. If you can though, try out the game before the online content gets taken down! This is a really unique experience with a lot of heart put into it, and you get that sense from the sentiments shared by the art team in this interview. Another point I’d like to mention: Kohei Tanaka scored the music. He also scored the music for one of my favorite anime series ever: Gunbuster (1988-1989). If you’ve seen this then surely this is an easy selling point. If you have experienced this game series and watched Gunbuster then it will not be hard to imagine that the same man scored both soundtracks. Anyway… here’s the actual interview. The majority of the illustrations contained in this book were crafted by hand from the Gravity Rush art team. Published here are the thoughts and reflections from the following members of the art team: director Keiichiro Toyama, main character designer Shunsuke Saito, and concept artist Takeshi Oga. Their passion towards artistic creation and the work environment under which this project was developed comes through in this interview. Keiichiro Toyama (onwards, Toyama): First of all it was very important that we made it in time for the release of Gravity Rush on PS Vita, and so the game ended abruptly at the climax of our initial story ideas. However, for Gravity Rush 2 we were able to complete the story we conceived all the way to the end, and so I felt a huge sense of accomplishment. At the same time, I felt a sense of loss. It’s the same feeling I had as a child when I reached the final chapter of a story I liked. That being said, I still feel very happy. 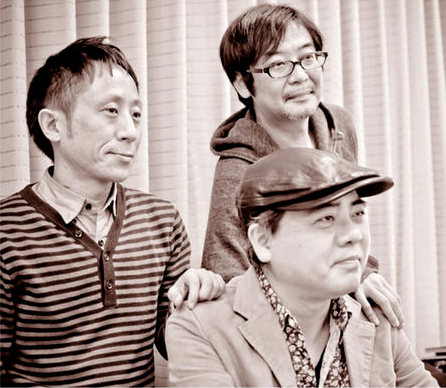 Takeshi Oga (onwards, Oga): Development officially started in 2008, so work on the series took place over a span of 9 years. The first title only contained about half of my ideas by the time it ended. It was around that time I was fleshing out the details of the apex arc. It was very unfortunate and I wondered what was going to become of the project. 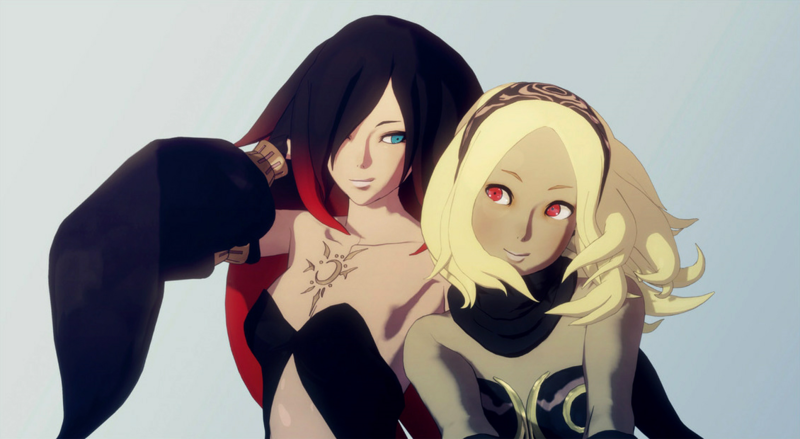 Then afterwards, I was very happy to hear that we were going to proceed with development on Gravity Rush 2. Jirga Para Lhao was the product of those details. I was able to add more to it, and came away quite satisfied. Shunsuke Saito (onwards, Saito): As the other two have said, we weren’t able to make it to the apex arc in Gravity Rush *laughs*. As a member of the staff I had those thoughts in mind even when production on Gravity Rush 2 started. During development, I’d think things like “I wonder if we won’t reach the apex again.” By the time we got back to Hekseville, I wondered if the then exhausted production team was even going to be able to proceed to the next chapter *laughs*. Despite that, we were able to make it to the very end thankfully. Toyama: I think that ends up being the case for any project. You’ll have a particular vision and things you want to do, but unfortunately production will always be accompanied with the problems of time and money. However, after the end of Gravity Rush, I kept in mind the fans who were waiting for the sequel and wanted to maintain my persistence this time. This wasn’t a relaxed undertaking where we could leave Gravity Rush 2 without reaching the apex, and go “… well I guess we’ll postpone it again to another sequel.” I’m really relieved that we were able to fully complete this, and I’m quite pleased to hear the reaction from fans post-release. Kat and Raven standing next to each other. This rendered image contrasts the two strikingly. Saito: The size of the world expanded to about 2.5x that of the previous title, but in reality it was probably several times more. I think the conceptual materials we prepared were many times more. Toyama: Considering the resolution differences between the PS Vita and the PS4, creating the cities is one example of an aspect that demanded a vastly greater amount of resources. Oga: Upon playing Gravity Rush 2, Hekseville feels small in scale, whereas Jirga Para Lhao is quite large. From the conceptual illustrations, there wasn’t necessarily that large sense of scale. Toyama: For Gravity Rush, the world was created from scratch. There’s a ton of Oga’s image boards from that process. The apex arc of Gravity Rush 2 was largely conceived from the conceptual materials from that time. Saito: The image boards prepared for Gravity Rush 2 pretty much came to life I think. Toyama: Only the weather in the apex area was changed. In the initial proposal, most of the story takes places in the grey and dim world of Hekseville. I wanted to contrast that with a blue sky at the apex. By the way, Gravity Rush 2 ended up having that same blue sky from the beginning. The largest change was probably that. This is a illustration guide for Kat in the comic cutscenes in the game. 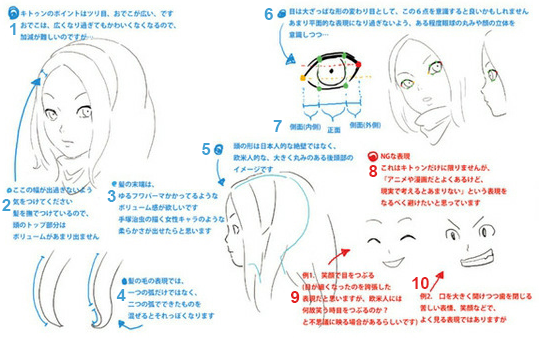 It contains notes for how to illustrate her distinctive voluminous hair and her smile. It’s very interesting insight into her design. 1. Main things to take note of are Kat’s almond-shaped eyes and her large forehead. If the forehead is too large then she will lose her cuteness factor, so maintaining that balance is difficult. 2. Be careful not to make this width too large. Her hair is well combed, so the top part of her head shouldn’t have too much volume. 3. The ends of her hair should be illustrated with enough volume as though she’s had a perm. It should look soft like that of the female characters Osamu Tezuka drew. 4. To illustrate the hair properly, do not draw just one arc. Draw two arcs so that it looks like this. 5. The back of her head should not be shaped like the flat Japanese style but rather the rounder Western style. 8. Bad Expressions. This isn’t limited just to illustrating Kat, but try to avoid expressions which can be seen often in anime and manga but don’t actually appear in real life. 9. Ex 1. Closed eyes while smiling (the eyes are made narrow here for the purposes of an exaggerated expression, but westerners would wonder why the eyes are closed during a smile. It seems to be a point of mystery). 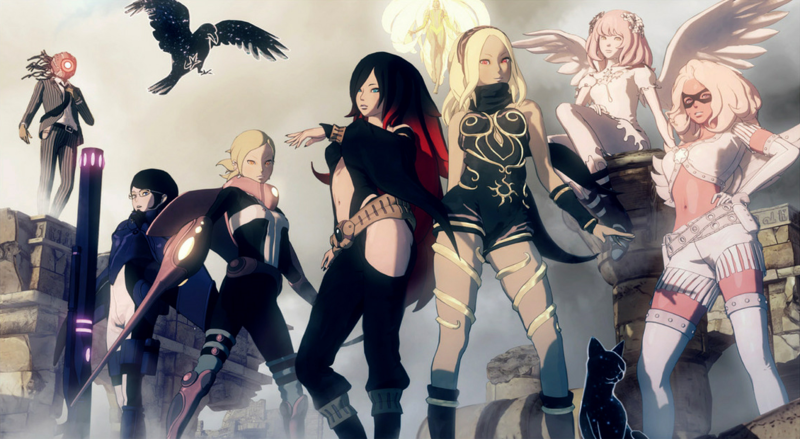 This rendered image contains the main cast of Gravity Rush 2 assembled together. In the initial public release of this image, the presence of Yunica and Permet on the left was covered up (see below). Toyama: The one character I had the most difficulty conceiving of was Kat herself. In contrast, the dark rival Raven and the supporting character Syd were easy to picture. “A girl who could control gravity.” What kind of appearance or personality would be fitting for such a character? I had no idea. Even when we moved onto the production of Gravity Rush 2, I didn’t know to what extent Kat’s clothes should be changed. 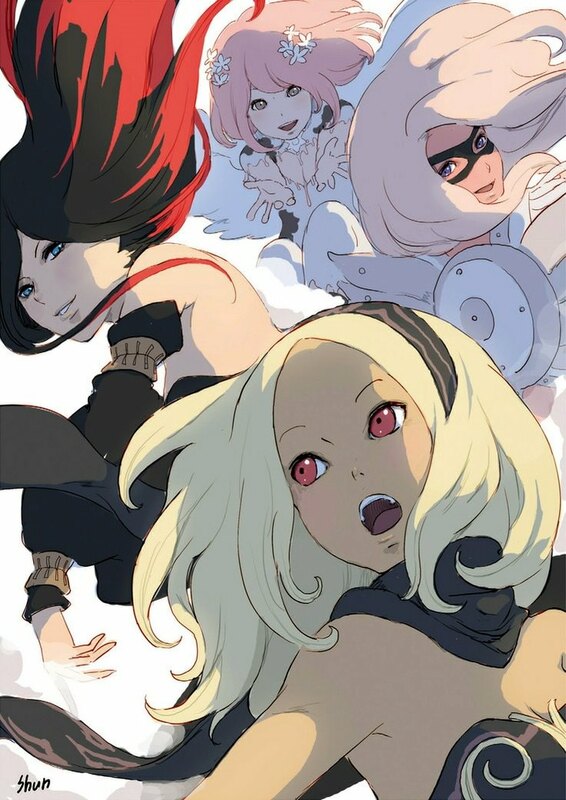 Saito: Regarding Kat’s design in Gravity Rush 2, small details were changed but the instructions were to leave the overall image and impression unchanged. As the character designer, the most time consuming character design was Kat, but I also like the handsome Syd when he’s serious or Vogo who was introduced in Gravity Rush 2. Oga: Toyama gave us “worldview” as a keyword to take note of while reading the script. For example, to really imagine what the towns and cities in Hekseville were like you had to be able to say with confidence “ah, this what the town is” when you pictured it in your mind. It took a long time to really build up that level of confidence. It wasn’t enough to just draw just one illustration. Jirga Para Lhao was also difficult because of this. Toyama: For the production of Gravity Rush 2, we traveled within Asia and places like Mexico to promote the first game. The impression left on me was very strong from those travels. The behind modernized buildings you could see a clutter of vestiges of the culture there. That was the kind of impression I had. I think Oga was also captivated by something during those travels. Oga: Definitely. When we went to Vietnam there were several times where I thought “this is it!” Until then I’d had been worriedly fumbling around, but finally I reached this level of confidence. You don’t often get the chance to design a world in its entirety like we did in this project. It was tough but really fun. Toyama: When you fly above the tall buildings of Jirga Para Lhao, you really get a sense of fulfillment. Hereafter I don’t think I’ll get to work on a project to create a world to my liking more so than I was able to for this one *laughs*. Celebratory illustration of Gravity Daze 2’s release by Shunsuke Saito. This image was published on his twitter account. The viewer can grasp the gentleness of Kat, Raven, and the others in this image. Saito: Oftentimes for background NPCs in open world games are put together by assembling separate parts to increase the variety of the character models. However through this method you end up losing the sense of design that goes into creating a single, whole character. For the Gravity Rush series, I prepared uniform designs first and from there I would refine and adjust details to create variety. I think this ties into crafting the worldview. 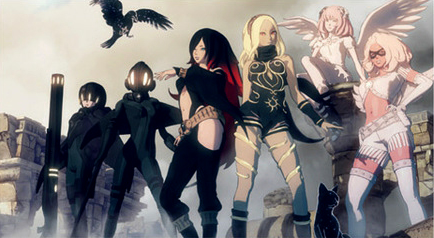 Again, the emphasis on the worldview is a unique aspect of the production style employed for Gravity Rush. For example, typically the staff on some project are trying to look for the precise vision of the world envisioned in the director’s mind. In the case of Gravity Rush, Toyama would have some concepts in mind and tell us as long as we abide by some general guidelines, we could do whatever we wanted. So the project was the culmination of the collective visions of the staff. This kind of directorial style is quite unique. Oga: I think Toyama is the sort of person that says “I like things that don’t look similar to anything else” or “I want to see something I’ve never seen before.” He doesn’t give instructions like “I want it to look like this specific thing”. From our perspective, this kind of directorial style really encouraged us to try things out many different things. 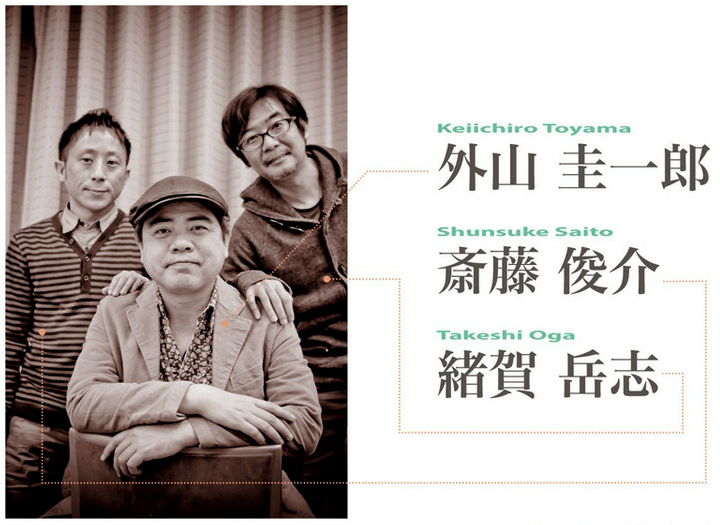 Toyama: Personally, I think of film or TV production when it comes to game direction. For the former you have the art director, the lighting director, the scriptwriters, the actors… and from all their individual touches you are more likely to create something unexpected and unique. I really take that to heart. Something produced purely from my ideas only wouldn’t result in something interesting. I understood that, and so I choose the collaboration of ideas. More so than this being my preferred style, there’s no doubt that this collaborative method is better for creativity. For example, although fundamentally the concept that Kat was able to manipulate gravity was kept unchanged, the particular form this would take would change every time a staff member pitched in. At first I didn’t envision punches and kicks, but the planning staff would point out “you guys are trying too hard to do overly difficult things.” As a result, we made those simpler attack actions to balance with the more complex gravity based actions. I’m really thankful for that kind of feedback, honestly. The cover illustration for this book, drawn by Takeshi Oga. The world of the Gravity Rush series is packed into this single image. You can see the progression of creating this color illustration filled with attention-grabbing details. Once the general framework of the composition is determined, the viewing angle and the atmosphere are put together. Several characters and Nevi are placed throughout as well. Saito: As Toyama has already said on many other occasions, we were influenced by the works of Mœbius and other Franco-Belgian comics and then we created Gravity Rush. I’d be very happy if the creators of future generations were influenced by Gravity Rush in the same way. As a creator there’s no greater joy than this I think. Oga: The kinds of people that would purchase this book probably have an interest in the video game industry and the conceptual materials created during the game production process. I hope that our passion comes through in the concept art we made to create the world that is Gravity Rush. Toyama: This project has allowed us to really engage in a creative process. We made sure to maintain appreciation and respect for our influences. Throughout my entire career thus far as a game creator, this is the project I really wanted to do no matter what. It’s the one to which I had the greatest emotional attachment. “Gravity action” is a strange and difficult experience to convey. However, the project finally got completed by the end of the sequel. The things I wanted to do originally have come to life, and now the series as a whole is great. It’s all thanks to the fans that found this somewhat bizarre game and took to it. I’d be quite pleased if you all enjoyed Gravity Rush and Gravity Rush 2 to your hearts’ content. Thank you.